5.High screen efficiency, great capacity and longer service life. After long-time practice, it has been proven that the screen is of great screen capacity, reasonable technical data, structure with high strength and rigidity, high standardization and universalization, reliable operation, low noisy and easy maintenance. 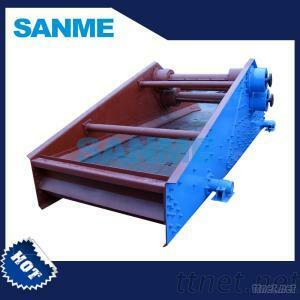 Linear vibrating screen is driven by double motors which make the motions of synchronous and reverse rotation, and the exciting force produced by eccentric block is offset in parallel to the motor axis direction while it is summed to the resultant force in a direction perpendicular to the motor axis, thus the screen machine motion trajectory is a straight line. The two motor shafts shaped a slope angle with the screen surface combine with the resultant force of the exciting force and the gravity of materials, which throw the materials forward in a straight way and achieve the purpose of sifting and grading. It can be used in the production line to materialize the automatic operation. Meanwhile, it features low consumption, high efficiency, simple structure, easy maintenance, fully-closed structure and non dust overflow, etc. It is widely used for complete product line in the fields of chemical engineering, pharmaceutical, building materials, mining, coal, and metallurgical industries.